Food company Cal Fresco, LLC is voluntarily recalling its Jalapeno chili peppers, as well as its Serrano chili peppers. These particular produce products are believed to be contaminated by the Salmonella bacteria. The problem was discovered when samples of both types of chili peppers were found to be positive for the bacteria. Salmonella is a harmful bacterial contaminant. For healthy people who become infected with Salmonella, common symptoms would include a high fever, diarrhea (sometimes bloody), nausea, and headache. However, for people with weak immune systems, for children, and for elderly people, a Salmonella infection can cause serious medical injuries that can lead to death. Salmonella infections can also cause arterial infections, arthritis and endocarditis. To date however, there have been no medical emergencies reported that are linked to the recalled chili peppers. The recalled Jalapeno chili peppers were distributed to retailers in Spokane, Washington. These chili peppers are believed to have been sold in stores between December 3 to the 12th. The lot code for the affected products is 205610 and the recall for this type of chili pepper is limited to one lot only. 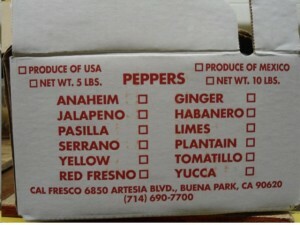 The Serrano chili peppers were also distributed to retailers in Spokane, Washington. These chili peppers are believed to have been sold from December 8 until the 21st. The affected lot number for this type of chili pepper is 205467. Consumers are advised to dispose of the recalled product instead of consuming it. They may also return it to the store in exchange for a refund.